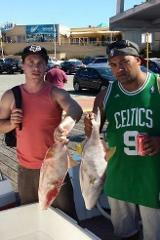 Our most popular day fishing trips off Perth operate all year, offering you a variety of fish from season to season. 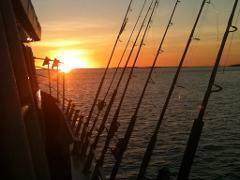 Blue Juice Charters would love you to join us on a night fishing expedition for an exhilarating and different challenge. We take you out from Hillarys Marina at 5:30 in the afternoon, sailing of into the western sunset. For decades, Samson Jigging in Western Australia has been a magnet for thousands of people from around the globe, Blue Juice Charters were their when it began from Hillarys. Off season deep sea fishing trips target differnet species, like Oceanic Jackets and Knife Jaw. Please note the annual demersal restrictions from the 15th of Oct to the 15th of Dec prevent us from catching snapper Dhu fish etc. 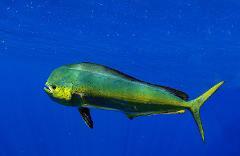 From late January the warm Leeuwin current brings some hot fishing action with the Mahi Mahi off the Perth coast. 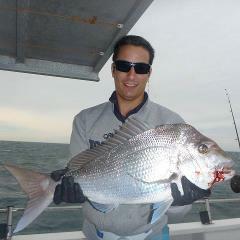 Our most popular day fishing trips off Perth operate all year, offering you a variety of fish from season to season. now take an exclusive 2 day trip staying in the bays of Rottnest Island overnight.